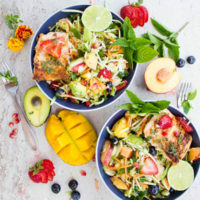 These Grilled Salmon Nourish Bowls are packed with vitamins and protein from shredded Brussel sprouts, Napa cabbage, kohlrabi, broccoli, sweet seasonal fruits, grilled salmon and a chia seed orange dressing. 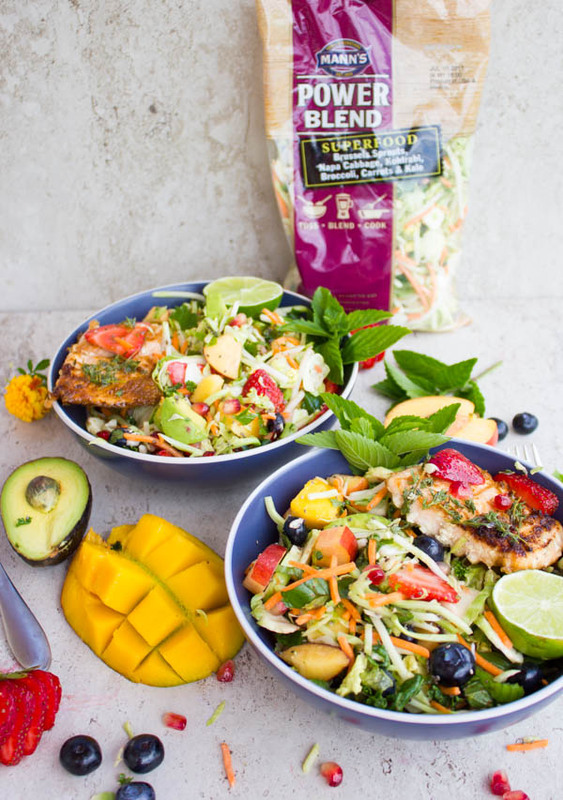 Summer is not over for me yet, and fresh meals like these Grilled Salmon Power Blend Nourish Bowls are everything I need! 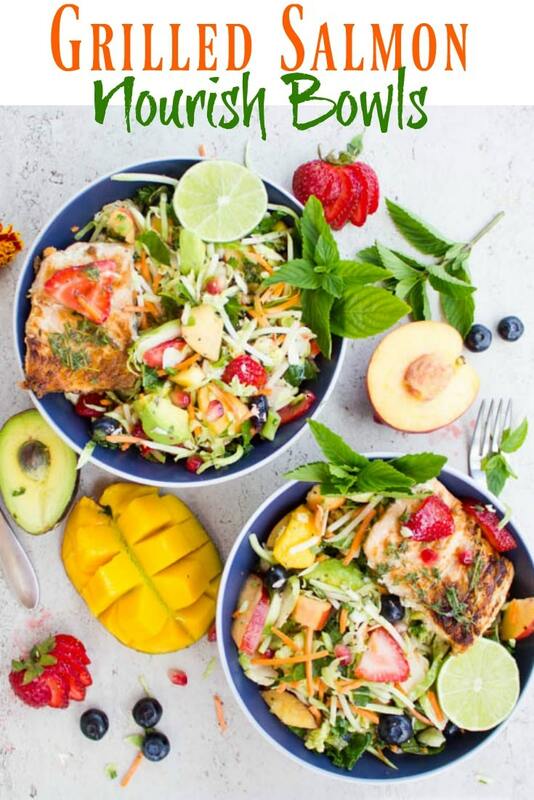 Imagine a decadent bowl of power blend (shredded Brussel sprouts, Napa cabbage, kohlrabi, broccoli, carrots and kale), add to that a rainbow of sweet seasonal fruits, grilled salmon and a chia seed orange juice dressing. 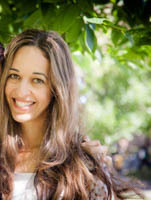 While fall is beautiful and comforting, and every season is special, summer has this energy that’s almost invigorating. It reminds of me of Miami and the beautiful memories I have of that place. If you’re living there right now, I ENVY you! I love Summer and its’ fresh vibrant food! I’m one of those who wishes for Summer to last forever! 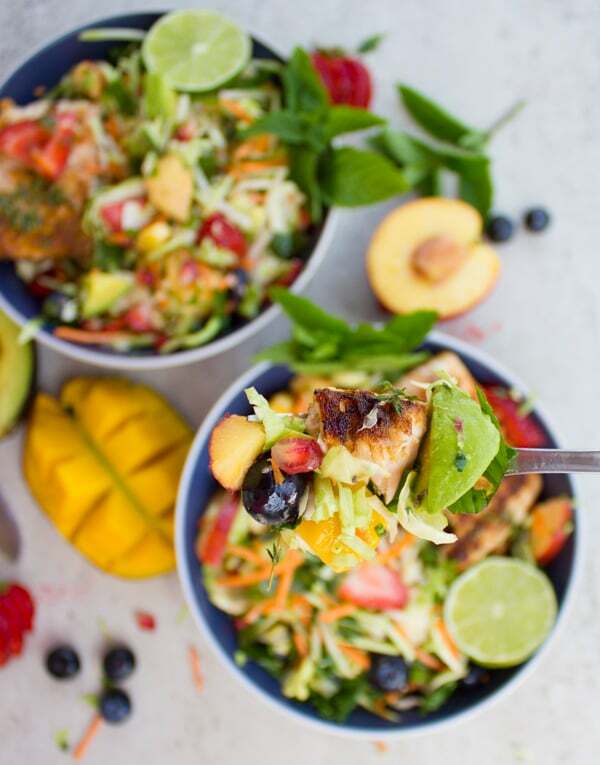 These Grilled Salmon Nourish bowls represent everything I love about my favourite season! 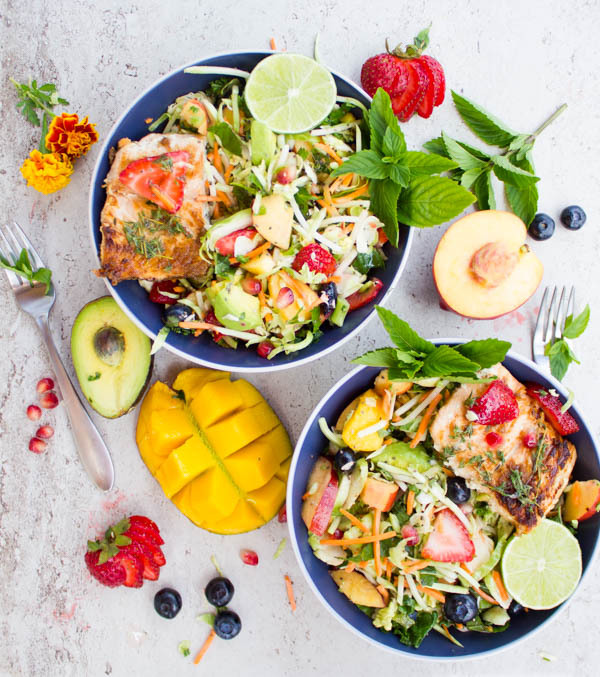 Every bite of these Nourish Bowls is a load of superfood goodness: Crunchy, sweet, juicy veggies and fruit, tender salmon and bright zesty orange dressing! Quick, easy and satisfying. This easy recipe starts with the grilled salmon. I chose to grill the salmon for today’s recipe because it was a perfect excuse to fire up the BBQ. Obviously, you may bake, broil or sear pan the salmon too. The base of these Nourish bowls is a healthy blend of fresh, shredded Brussel sprouts, Napa Cabbage, Kohlrabi, broccoli, carrots and kale. Absolutely amazing! 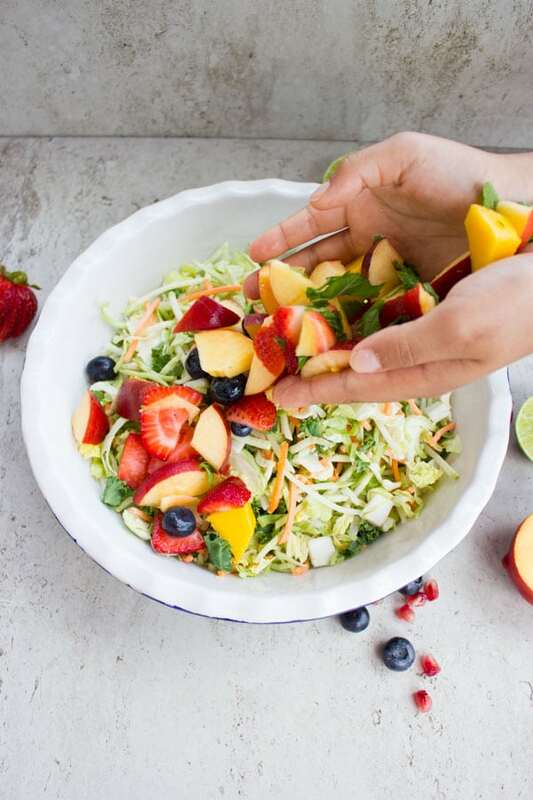 To sweeten those up I throw in my favorite Summer rainbow fruits, use your favorites here rather than sticking exactly to the recipe. I’ve added fresh strawberries, blueberries, mango, peaches, avocados, pomegranate arils and apples. Now zest things up with a dressing made of olive oil, scallions, chia seeds, mustard, orange juice and toss everything together! These grilled salmon nourish bowls are like a treat! Even my friend who isn’t a salad person at all LOVED these bowls. She came over during the photo shoot and probably hoped for a chocolate treat, but instead found a huge colourful bowl of salad with grilled salmon. At first, she said: “Listen, no offence but I’m only eating the salmon”. I told her to go ahead. Accidentally she got a bite of the sweet fruits, crunchy Power Blend and actually LIKED that taste. She continued. I watched. 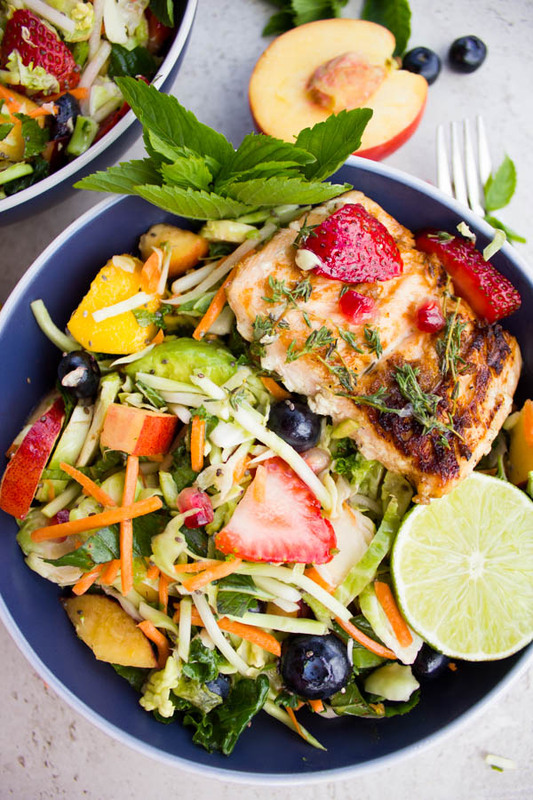 When she was done eating her Grilled Salmon AND all the salad, admitting that the crunch was addictive and the fruits added so much sweetness that she might actually have to rethink her notions about salad. Grill the salmon on very high temperature to avoid sticking to the griddle. Grilling salmon with its’ skin on prevents sticking and breaking apart. Start grilling skin side down first, and if you’re not a fan of crispy fish skin, then just remove the skin once the grilled salmon is ready. Preheat the grill to the highest setting. Rub the salmon with seasoning, thyme and oil. Place it on the grill skin side down and let it cook for 3 minutes before flipping the fillet. Cover the grill and let the salmon cook for 3 more minutes until cooked through. Once ready, squirt the lemon juice (to your taste). In a large bowl add the Power blend, fruits and toss them well. In a smaller bowl add the dressing ingredients and whisk until smooth. 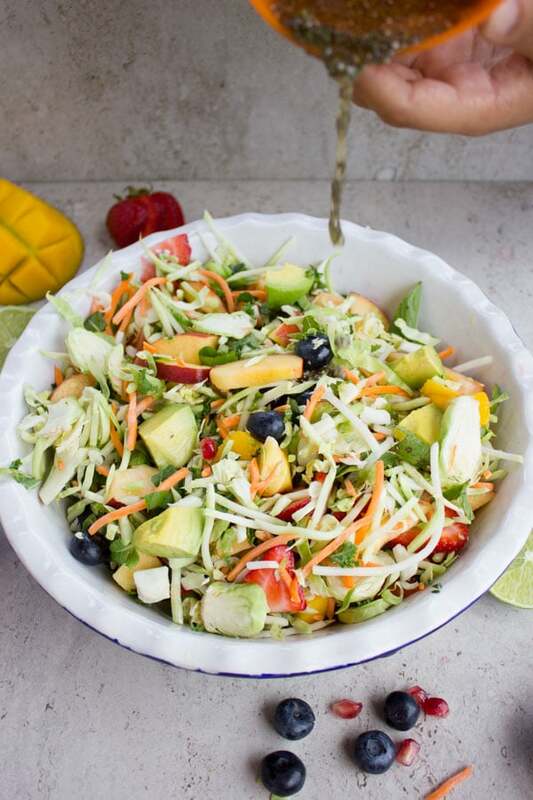 Pour the dressing over the nourish bowl and toss them well.